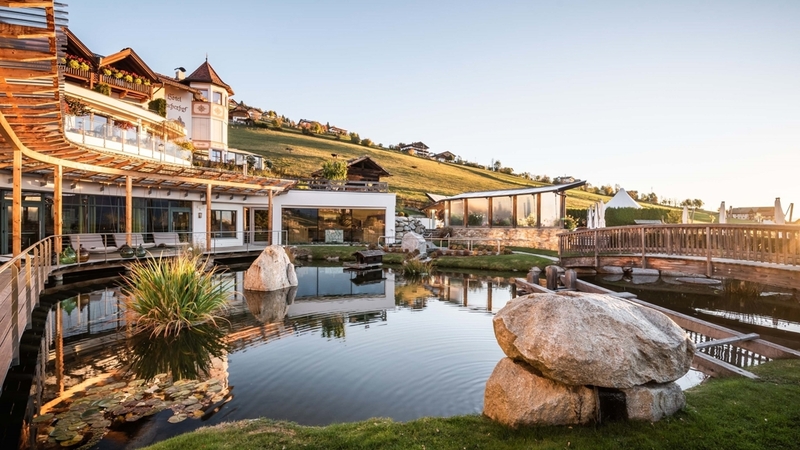 Only 500 m from the family-friendly hiking and skiing area Gitschberg, excellent cuisine, first-class service, indoor pool as well as inviting beauty & wellness area with a panoramic event sauna. Our Hotel is located at 1,414 meters above sea level on the beautiful plateau of Meransen in the middle of the mountains. Here you will experience the typical South Tyrolean hospitality and a unique holiday that promises to be unforgettable. After an eventful day in the mountains you can spend your time relaxing in one of the best spa areas covering more than 1,100 square meters and recharge your batteries with the energy of the Alps. Moreover, we offer a vast culinary program with aperitif, candlelight dinners, champagne breakfast, Italian evening, cheese buffet, dessert buffet and a vast range of fresh salads. Last but not least the environs of our Hotel Bacherhof are characterized by the beautiful landscape of the Dolomites and the Alps. Next to our house you can find more numerous huts, shelters and mountain tops, which are ideal destinations for your excursions and walks. Single accomodation in 17 square metres, high-quality solid wood furniture, cosy seating, desk, TV, radio, telephone, shower and WC, bidet, hair dryer, vanity mirror, safe, minibar and free wifi included. Please note that this room has no balcony! Home made products, Bike rental, Gratis Skibus, Deckchair, Ski depot in the house, Ski rental, Hiking Guide, Journals at disposal, Multilingual receptionists by day, Shuttle service (train station, airport), Baggage porter, Pets allowed, Snow boot dryer, Shuttle service, Bike deposit, On the slopes, Quiet position, above 1000 m a.s.l.